With the Hamelin merger behind us, we are poised to make the most of our European markets, especially those in Russia and Eastern Europe. Across the business, we have cut costs and improved our gross margin, broadened our appeal and increased our market share. However, there’s plenty more work to do to compensate for an envelope market that contracted more than we expected. Over the next three years we intend to consolidate our market-leading position within envelopes, grow organically through Propac, and reduce costs and net debt even further. The most significant event over the past few years was the merger with Hamelin in 2010. The subsequent integration of markets, systems, products, and staff demanded time and effort. That integration is now complete and generating the expected benefits of better purchasing power, lower costs, and wider markets. Integration has created the structure that enabled us to increase our market share and improve our gross margin in 2012. In short, the merger was a success. Our post-merger programmes of fixed-cost reduction, working-capital reduction, and asset sales are on or ahead of plan; we have reduced net debt by SEK 200 million; and our French business unit is the most profitable within the company. In the UK and German markets where there was overlap between Bong and Hamelin, we have harmonised IT systems without compromising our high standards of customer service. Our customers now deal with a single unified company. Another benefit of the merger is that our packaging products now reach a much wider range of customers in France and Spain. In Europe, the envelope market has contracted more than we expected as customers switch from paper to digital communications and stagnation in the European economies continues. Although we’re pleased to have increased our market share, we’re not standing still. We continue to adapt to changing market conditions by adjusting our product range, moving into new markets, and drawing closer to our customers. This additional restructuring will help to bring us back into line with our original business plan. 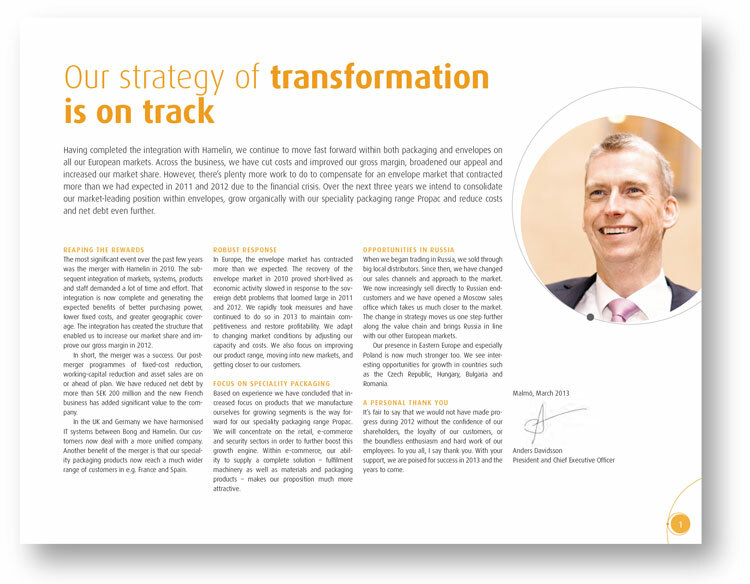 Our eight years’ experience of the packaging market has given us plenty of opportunities to test various products and market segments, and to refine our internal processes. Some have proven successful; others, less so. Along the way, Propac has evolved from an independent European concept to a company-wide range of products that sits comfortably within the overall Bong offer. Experience shows that the path to growth is through packaging specialisms. We are focused on the retail, e-business, and security sectors. Within the e-business sector, our ability to supply a complete solution – fulfilment machinery as well as materials – makes us a much more attractive proposition. When we began trading in Russia, we sold through big local distributors. Since then, we have improved our sales channels and now sell direct to Russian wholesalers. The change in strategy moves us one step further along the value chain and brings Russia into line with our other European markets. Since our factory in Kaluga is a four-hour drive from Moscow, we opened a Moscow sales office. It takes us much closer to our customers. Our presence in Eastern Europe and especially Poland is now much stronger too. We see huge opportunities for growth in the Czech Republic and in Hungary and Romania where our biggest competitor has an almost 100% market share. It’s fair to say that we would not have made progress during 2012 without the confidence of our shareholders, the loyalty of our customers, or the boundless enthusiasm and hard work of our employees. To you all, I say thank you. With your support, we are poised for success in 2013 and the years to come. We wrote website and marketing materials for Bong – a company listed on the Swedish stock exchange – for many years. 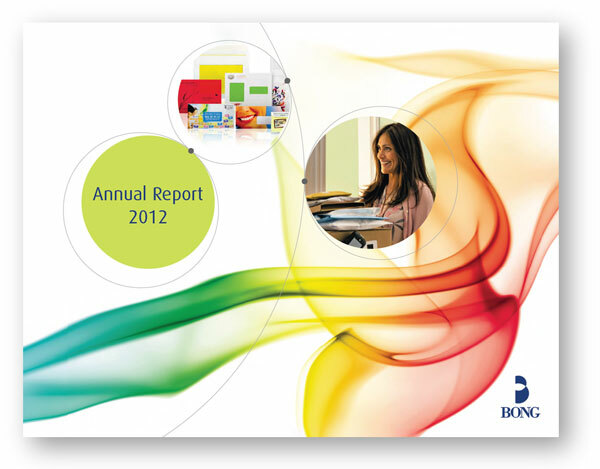 Towards the end of our relationship we also drafted the introductory pages to the 2011 and 2012 annual reports – the pages that described the business, the progress it had made during the past year, and its plans for the coming years. The text between the quote marks is our draft of the CEO’s report, not the final version that appeared in the 2012 annual report. But it’s not far off. For the most part, Bong used our draft as we wrote it.